My Crossroads: Raph is 14 Now! It’s my first-born nephew’s 14th birthday. Raphael Moses or Raprap got all our attention when he was born. He’s a very cute baby boy who resembles his mother more than his father (my brother). When I was still single my brother will bring Rap to our house and I’ll take care of him the whole day which he enjoys very much because I spoil him. As he grows older he always look upon me as someone who will give in always to what he wants – especially when it comes to his favorite foods, I can’t resist his requests. He’ll always ask me to cook leche flan for him with or without occasion. Whenever I visit their house he will rush to their store to gather all the ingredients and he’ll make me cook for him. Honestly I feel happy doing it for him and his siblings because it’s my way of showing my care and love for them. Today he’s beginning to enter adolescence period we’re advising him always what he should be doing or how he should act like a young man. He has grown as a very tall young man and girls I their school has a crush on him but Rap is choosy. He also has his attention on music ministry and sports. 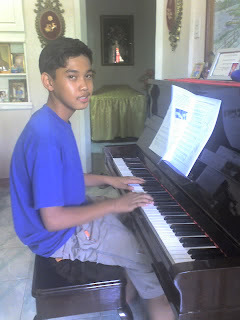 He’s having piano lessons for a year now and he’s good on other instruments too like his father also. Music and arts runs in our family and Rap seems to get the skills in music without so much effort.